I don’t talk about Vietri Flatware often, so please allow me to introduce you to this gorgeous flatware designer. Vietri is the passionate result of the Gravely sisters, Susan and Frances, who were first captivated by the San Pietro Hotel’s colorful, handcrafted Italian dinnerware. On their trip to Positano, Italy, the southern sisters visited a nearby factory in Vietri sul Mare where they watched as artisans carefully painted, glazed, and fired each piece by hand. They returned home with a variety of "mix-and-match" pieces featuring cows, horses, rams, flowers and fish where it did not take long for friends and family to begin coveting their unique pieces. Excited that others were equally enthralled by their uncovered, the Gravely women decided to import the dinnerware and flatware to sell in retail stores across the United States. Thus Vietri was born and named as a tribute to the town where it all started and a play on the phrase "tre vite," Italian for "three lives." Thirty years later, Vietri maintains its vision of celebrating handmade, heritage-inspired collections that support the history of Italy while adding a bit of Tuscan charm to your dinner table. Each piece is authentic and unique, born from the earth and inspired by Italy; a true work of art to be treasured for its one of a kind characteristics. Vietri flatware comes in a variety of styles ranging from flatware with acrylic, stainless steel or pewter handles. There is even a collection produced specifically for children, but whichever style you choose, you are sure to receive finest quality flatware. My favorite collection is the Vietri Aladdin flatware. 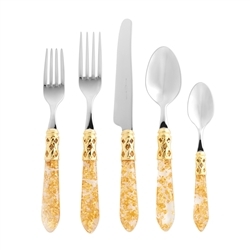 The flatware collection comes in Antique, Brilliant, or Gold Fleck and feature elegant pearlized handles with the strength of high-grade acrylic and 18/10 corrosion resistant stainless steel. The Aladdin Flatware is dishwasher safe allowing you to bring quintessentially Italian serving pieces to the table without the hassle of hand washing and tedious cleanup. 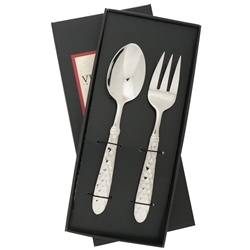 Chelsea Gifts Online also offers the Vietri Martellato Flatware collection. The hammered detail on the handle makes this by far the most popular Vietri flatware collection. Forged by hand using 18/10 stainless steel in Lumezzane, Italy, by the Bugatti family, Martellato flatware is a well-balanced, weighty flatware that you are sure to love. The Vietri brand combines the richness of European culture with a sophisticated American spirit by creating fashion forward, yet classic, Italian home accessories designed to complement the good life and celebrate Italy and all that it encompasses. Chelsea Gifts Online believes in and is proud to carry the Vietri brand whose mission to inspire the celebration of life with family and friends through the joy of handcrafted Italian designs for the table, home and garden has remained the same for the past 30 years. To learn more about Vietri flatware or the brand visit Chelsea Gifts Online or stop by our store.